The magnolia tree is blooming in the garden this week. I try to spend time every morning and evening taking in the heady beauty of creamy brushed-cotton dinnerplate blooms bound to bare branches against the early April sky. One strong spring storm and it will be over, the ground splattered with petals bruised and brown. And while there might be one or two errant blooms over the summer months, that’s it. What’s the point of a magnolia tree? Two weeks of beauty at most, some years not at all if there is a late frost. The rose of sharon flowers for a much longer period. Lilacs at least have the added value of strong perfume. Magnolias definitely have limits. Often that’s the case when we take on a project, work in a community, or build personal or professional relationships. No matter how well things go or how hard we try, there are limitations that can lead to disappointment or even a sense of futility. At those times, we need to refocus and consider what we have accomplished or how the relationships do sustain and fulfill us. It is so much easier to see limitations rather than all the good that has occurred. They are predicting rain for the next few days. 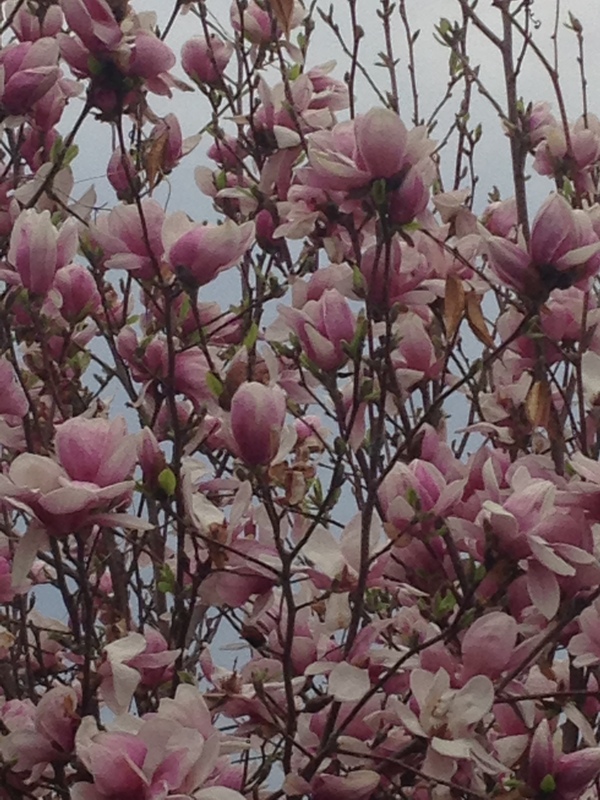 But until the storm sets in the magnolia will keep blooming. They continue to do their part, in spite of limitations, and so will I.